Vanderbilt University is enforcing a rule requiring student groups to accept anyone who wants to join, and allow all members to run for leadership positions. The policy creates a dilemma for faith-based organizations: Either drop requirements that leaders hold certain beliefs, or forfeit school funding and move off campus. 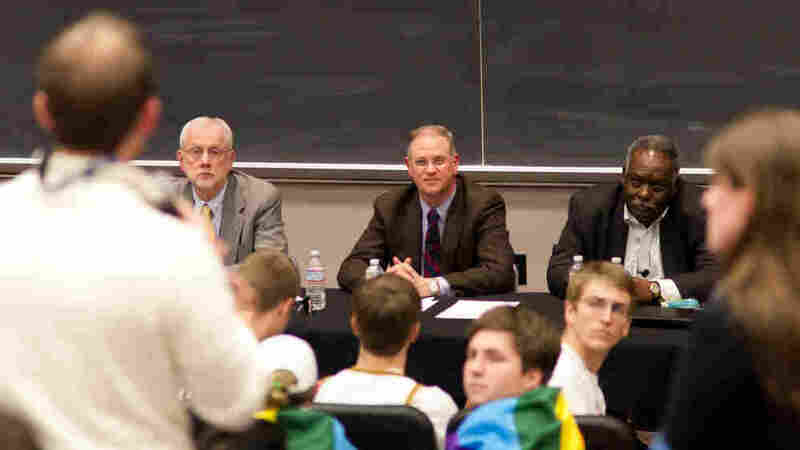 Vanderbilt administrators and faculty field questions at a January 2012 town hall meeting on the school's controversial "all comers" rule. Many campus religious groups say aspects of the policy are discriminatory. 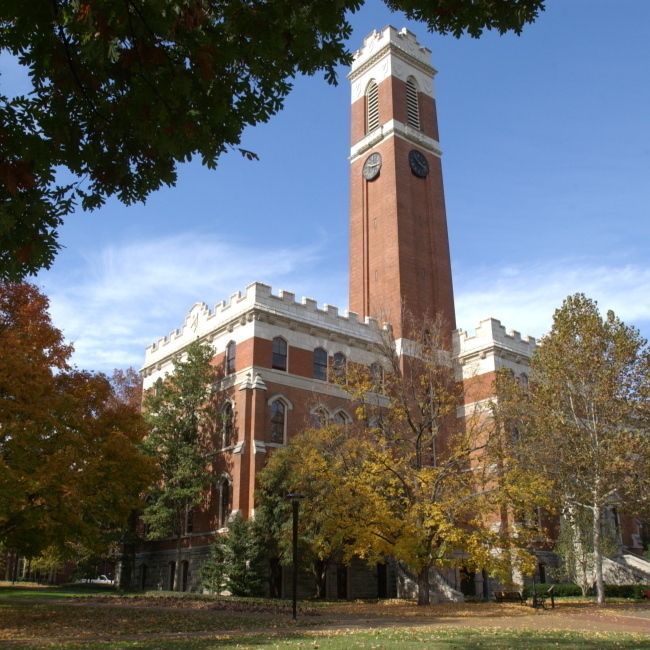 Administrators at Vanderbilt University are beginning to enforce a long-held nondiscrimination policy for student groups. The policy is forcing a dilemma for faith-based organizations: Either drop requirements that their leaders hold certain beliefs, or forfeit school funding and move off campus. Members of Christian student groups say Vanderbilt's nondiscrimination policy has them feeling more like victims of discrimination. They include the school's star quarterback, junior Jordan Rogers. The little brother of NFL superstar Aaron Rogers is a member of the Fellowship of Christian Athletes. It's one of more than 400 student groups at Vanderbilt being required to comply with an "all comers" rule. College Democrats have to accept Republicans and vice versa, and religious groups must welcome atheists. They say they're fine with that. Vanderbilt University's Kirkland Hall. A controversial nondiscrimination policy has roiled the campus. But under the policy, all group members must also be eligible for leadership positions, which is where many draw the line. Rogers joined the chorus of opposition at a recent town hall meeting on campus. "If someone that doesn't share the faith is teaching," Rogers asked, "then what's the point of even having these organizations?" A 2010 Supreme Court decision affirmed that institutions can legally refuse to recognize a religious organization unless it allows all students to join. As on other campuses, controversy surfaced at Vanderbilt when several gay students were asked to leave a religious fraternity. That's when the university stepped up enforcement of its nondiscrimination policy. School administrators believe they have support from most students, though few speak out at public forums. Student Cole Garrett is one of the few who have spoken publicly in support of the rule. "My name is Cole Garrett," he said at a recent forum. "As you may assume by the giant rainbow flag on my back, I am a gay man, and this is a very sensitive and important issue to me." Christians have a right to ... choose their leadership on this campus — and they seem to be the primary group that's singled out by this policy. Garrett says the all comers rule has also allowed him to become an officer in the Asian American Student Association, even though he has no Asian ancestry. At a campus volleyball tournament, where sorority sisters in matching tank tops are practicing, sophomore Christine Rodriguez says she supports the university's position. She says the school's faith groups are dancing around the real issue: sexual orientation. "Because obviously they can't openly say, 'Oh yeah, the reason we're so angry is because ... we don't want gay people in our organization,' " she says. "But you'll hear it from other people like me." Rodriguez is a proud member of Alpha Chi Omega, which doesn't exactly practice what she's preaching. But the selective pledging process of secular sororities and fraternities is unaffected: School officials say the federal statute known as Title IX protects the Greek system from the nondiscrimination rule. Vanderbilt alumnus Thomas Singleton, a retired businessman and donor, sees hypocrisy in the fraternity and sorority exemption. "If they insist on implementing this policy, I will probably stop all relationships with Vanderbilt," Singleton says. "Because I'm a Christian, and I feel like Christians have a right to express their views and to choose their leadership on this campus — and they seem to be the primary group that's singled out by this policy." Despite alumni threatening to put away their checkbooks, university officials have resolved to stand their ground. Vanderbilt Provost Richard McCarty sees maintaining the all comers rule as a way to overcome a checkered past with discrimination. The school kicked out a prominent black student during the civil rights era. "And maybe some of us who are old enough to remember those days don't ever want to go back," he says. Now, it may be religious groups that are asked to leave — but this time in the name of nondiscrimination.